Welcome to Greers Ferry, located on the shores of the lake that shares it's name, Greers Ferry Lake. 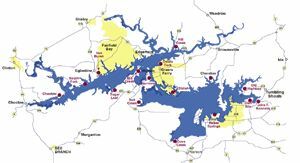 With over 40,000 acres of crystal clear water that is perfect for fishing, scuba diving, waterskiing, and boating, it is no wonder that Greers Ferry has become one of Arkansas' most popular tourist destinations for family vacations and group travel. In Greers Ferry, nothing is second rate, from world-class accommodations to fine dining, visitors to our area have come to expect only the best. It is our sincere hope that you will take a few minutes to browse our website and see all that we have to offer and to learn a little more about our community.